This month, Ed Voyles Automotive Group donated a new school bus to the Atlanta-based Cumberland Academy of Georgia. The new bus has been upgraded to make it more accessible for the school’s special needs students. Cumberland Academy of Georgia received a donation from Ed Voyles Automotive Group in the form of a new bus specifically upgraded for its’ students. Ed Voyles Automotive Group donated the new cargo bus and also donated to upgrades necessary for the special needs school. These upgrades included: adding seats and seatbelts, installing washable flooring and installing windows and special lighting for students. These updates offer Cumberland’s students a chance to ride in a bus made especially for them. Students gathered at the front of the school to watch and cheer as the new Cumberland bus was revealed to all in a special way. The board of directors, including board member Valery Voyles, gathered in the front of the school along with the entire student body. The principal drove the bus to the front of the school with all the students cheering. A student handed Ms. Voyles flowers while others read a poem of thanks as students recognized this very special donation. Because of Cumberland’s growing student body, it became important to find a bus that could accommodate its many students. This new addition to the school provides students the opportunity to travel in larger groups on field trips and on longer overnight travel. In addition, this bus will make it easier to transport students to go off campus to learn life skills at various businesses throughout Atlanta. 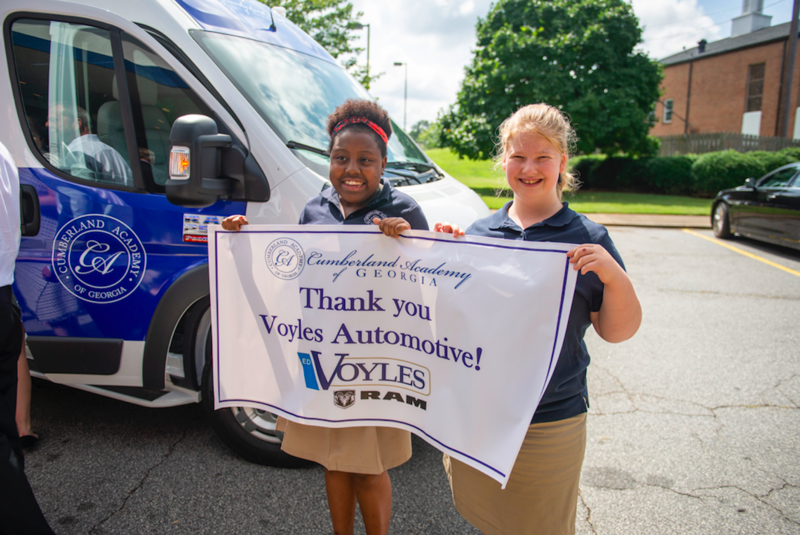 The school would like to thank founding board member Valery Voyles, other family members Bill and Ben Voyles, and the entire Ed Voyles Automotive Group for their kind-hearted donation to Cumberland Academy of Georgia.